This issue of Heart Failure Clinics, edited by Drs. 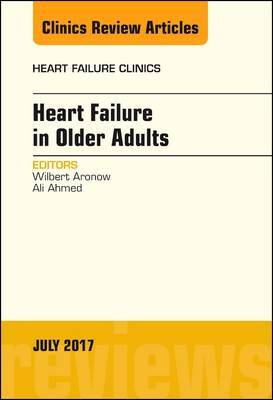 Wilbert Aronow and Ali Ahmed, will cover a wide array of topics related to Heart Failure in Older Adults. Subjects covered include, but are not limited to: Epidemiology, Pathophysiology, and Prognosis of Heart Failure in the Older Adult; DEFEAT Heart Failure: Clinical Manifestations, Diagnostic Assessment, and Etiology of Geriatric Heart Failure; Heart Failure with Preserved Ejection Fraction in the Older Adult; Heart Failure-Complicating Acute Myocardial Infarction; Interventional Therapies for Heart Failure in the Older Adult; Cardiac Resynchronization Therapy for Treatment of Heart Failure in the Older Adult; and Left Ventricular Assist Devices in Treatment of Heart Failure in the Older Adult, among others.